Textiles have been historically and traditionally used to make clothes, but even in ancient times there were technical textiles for making sails, tents, etc. Today, technical textiles are used in various industries for a host of purposes and applications. Recently, there have been exciting developments on various fronts in the textile field to impart novel and innovative functionalities to textiles, e.g., easy-to-clean or dirt-repellent, flame retardancy, anti-bacterial, and fog-harvesting properties, to name a few. Also, textiles for electronics based on graphene, CNTs and other nanomaterials, conductive textiles, textiles for sensor function, textile-fixed catalysts, textiles for batteries and energy storage, textiles as substrates for tissue engineering, and textiles for O/W separation have appeared in the literature. All this has been possible through adopting novel ways for finishing textiles, e.g., by appropriate surface modification techniques, and utilizing biomimetic concepts borrowed from nature. 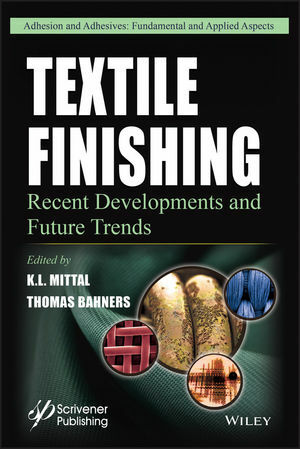 This unique book entitled “Textile Finishing: Recent Developments and Future Trends” is divided into four parts: Part 1: Recent Developments/Current Challenges in Textile Finishing; Part 2: Surface Modification Techniques for Textiles; Part 3: Innovative Functionalities of Textiles; Part 4: Fiber-Reinforced Composites. The topics covered include: Antimicrobial textile finishes; flame retardant textile finishing; “self-cleaning” or easy-to-clean textiles; metallization of textiles; atmospheric pressure plasma, and uv-based photochemical surface modification of textiles; tunable wettability of textiles; 3D textile structures for fog harvesting; textile-fixed catalysts; medical textiles as substrates for tissue engineering; and fiber-reinforced “green” or “greener” biocomposites and the relevance of fiber/matrix adhesion. Kashmiri Lal Mittal was employed by the IBM Corporation from 1972 through 1993 Currently, he is teaching and consulting worldwide in the broad areas of adhesion as well as surface cleaning. He has received numerous awards and honors including the title of doctor honoris causa from Maria Curie-Skłodowska University, Lublin, Poland. He is the editor of more than 130 books dealing with adhesion measurement, adhesion of polymeric coatings, polymer surfaces, adhesive joints, adhesion promoters, thin films, polyimides, surface modification surface cleaning, and surfactants. Dr. Mittal is also the Founding Editor of the journal Reviews of Adhesion and Adhesives. Thomas Bahners studied physics at the universities of Münster and RWTH Aachen from 1974 to 1981. He has been a research scientist at the Deutsches Textil-orschungszentrum Nord-West (DTNW), Krefeld from November 1982. In 1987 he obtained his PhD in physical chemistry at the University of Duisburg where he is now the Head of Department of Physical Technologies whose research focuses on soft matter material science, polymer physics, and surface design by means of physical technologies. He has supervised about 50 research projects funded by companies or national/European research programs, and published about 200 journal articles and book chapters.